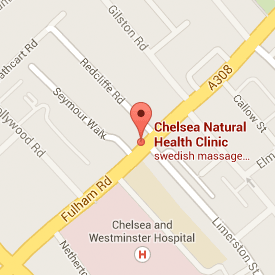 at Chelsea Natural Health Clinic, Fulham Road, SW10. The absolute beauty care in Daniela Health & Beauty studio. As a Jean D Estrees beauty expert she can provide comprehensive information concerning all So Nature ingredients and can demonstrate how to maximise their effectiveness for each individual skin type and need. Keen on bringing wellness and health to your skin, she will recommend the best that nature can provide. To fight against time passing, the best solution is to start an adapted and efficient anti-aging program. Daniela Health & Beauty studio invites you into a world of senses, in the heart of a luxurious nature. Sit back and enjoy the natural perfumes and delicious textures dedicated to the relaxation and well-being of the body and the face. Daniela is available at Chelsea Natural Health on Sundays.